The On-hold status is optional and is available if you enable it in Zendesk Support. On-hold is an internal ticket status for tickets that require input or resolution from a third party. On-hold status is visible to agents only, not end-users. For end-users, tickets that are set to On-hold are always displayed as Open. On-hold gives you another level so that you can more accurately track who currently has responsibility for a ticket. For example, imagine that your company produces a product that includes components from partners and other suppliers. If you have tickets that require their input, and for which the assigned agent can do nothing but wait, setting the ticket to On-hold provides a way for distinguishing between tickets that are the responsibility of agents and those that are waiting for a third party. If you track your agents' performance, using the On-hold status allows you to filter out all On-hold tickets from performance tracking. You can also use the On-hold status to create a workflow for tickets that require input or a resolution from a third party. On Professional and Enterprise you have an additional reporting metric called On-hold time in hours. The On-hold status is available on Team, Professional, and Enterprise. You must be an administrator to enable On-hold status. An administrator can add the On-hold status to Zendesk Support. On-hold status is disabled by default. Beside the Status field, click the options menu, then select Edit. Under Field Values, select Enable On-hold status. If you are disabling this option, deselect Enable On-hold status. 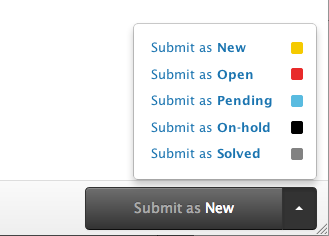 The On-hold status is added to the list of ticket statuses between Pending and Solved. On-hold status is visible to agents only, not end-users. For end-users, tickets that are set to On-hold are always displayed as Open in the Help Center customer portal. Community Tip! Check out this tip to see how Andrew sets reminders for On-hold tickets. You create new views, or edit existing views, to track tickets that are On-hold. You can select On-hold as the value of the Status condition and also use the Hours since on hold condition. The On-hold status is added to the Status condition between Pending and Solved. This means that the condition statement Status less than On-hold will return tickets that are Pending, Open, or New and Status greater than On-hold will return tickets that are set to Solved or Closed. The Hours since on hold condition allows you to specify the hours that have passed since the ticket's status was set to On-hold. You can use the On-hold status in two different ways in Insights. To measure the number of hours a ticket is on-hold, you can use the Hold Time (hrs) [Mdn] metric. If you have enabled business hours, you can view the On-hold time within business hours using the [Biz Hrs] On Hold Time (hrs) [Mdn] metric. Results will always be presented in the medium number of hours or minutes. On-hold time is also included as a value in the Ticket Status attribute. You can use the Ticket Status attribute to break down a metric by each status. 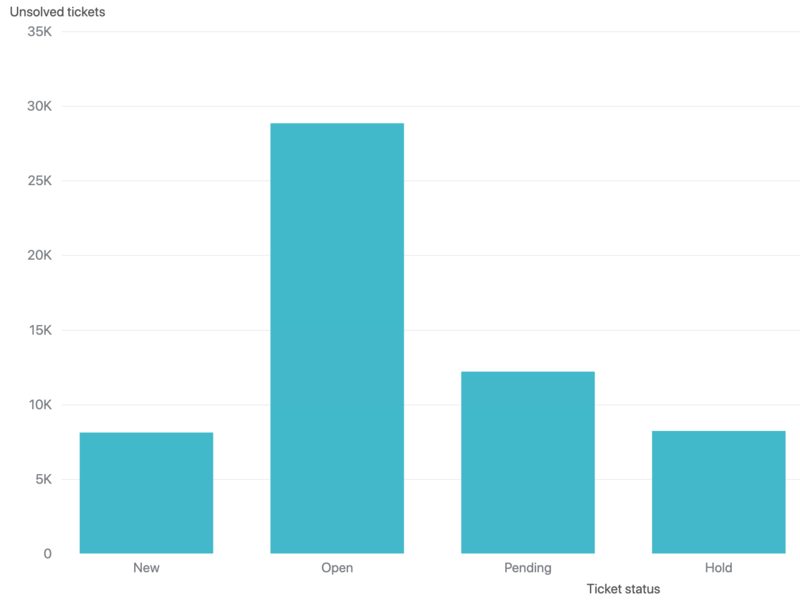 On the Insights Ticket pre-built dashboard, Ticket Status is used in the Current backlog by ticket status report. When you add the On-hold status, it will also affect the Requester wait time in hours and Current backlog metrics. The metrics will include the On-hold state in their calculations. Note: The Agent wait time in hours metric is not affected by the On-hold status. This metric is still defined as the cumulative time a ticket has been in a Pending state (awaiting a response from the requester). The On-hold status only affects ticket sharing agreements that use Make public & private comments; sync status. Because On-hold is an optional status in Zendesk Support, these ticket sharing agreements treat On-hold as Open. For example, if a shared ticket is set to On-hold by the sending account, the ticket is displayed as Open in the receiving account. All other statuses will sync normally. Just want to check, would you use "on-hold" status when you're waiting for a response from a Light Agent? I.e. someone within the organisation who isn't able to communicate directly with the Requester? Possibly, but if you are assigning it to the light agent, would it not be best to have the status open? I would use on hold more if the ticket was still assigned to me, but I was awaiting some outside communication. For your interest - I always use a tag that will reopen the ticket for me after a specified period of time 2 hours, 4 hours, 24, 48, 7 days etc. Thanks, @AndrewJ, but you can't assign a ticket to a Light Agent. Hence the question. The assignee remains the [full] Agent, but they are waiting on a response from the Light Agent. Ultimately it is down to your work flow as to what status to use when. As Andrew suggests on hold is typically when you are waiting on someone other than the customer who is not the assigned agent. So yes you could use on hold as you suggest. An option to allow our Customers to see the on-hold status would be incredibly useful. We use this status so our customers can raise suggestions which we would like to remain in Zendesk - but demonstrate to customers that we have read and responded to them and suggested that they are "on-hold" until a future time. Hello. So I am trying to add the on hold status, I am an admin, I click through to settings, select ticket fields, edit the "status" (which does say that it is a system field vs one of our custom fields) but I have no place to select the "on hold" feature. Can someone help me trouble shoot this? Are you on the Essential plan? The On-Hold status is only available on the Team plan or higher, so that might explain why you can't find it. Can end users see the status on hold? Ours seem to only see "Open"
It appears we might just need to turn on the visibility for end users but I wanted to verify. Appears we cannot edit "Visible to users" - Why not? On hold shows to users as Open. From my perspective this is the correct functionality. On hold can be used in a number of ways - but from a customers perspective, if a ticket is 'On hold' rather than 'Pending' , it isn't waiting on something from them, it is awaiting some action, event or update from us or a third party that we are somewhat responsible for. Fundamentally that is 'Open'. The 'On Hold' status is great for agents though as it moves a ticket that might be awaiting a third party or some event out of their actionable ticket queue. Why does the configuration provide the option to enable for end user but not allowed to be enabled? We use the "on hold" status for issues that are awaiting change from our development team in our software. If they could see that on hold status they could separate those tickets from current support open issues. Do I understand correctly that you are wanting your development team to see the on hold status? I'm not clear on where the devs are looking and expecting to see this, are they CCed on the ticket, or looking in the agent interface? Our dev team tracks the issue in TFS and our support keeps these tickets "on hold" so that we can keep them separated from our other open tickets. When the fix is done we test and then post back to the end user and resolve when possible. It just seems strange to have the configuration but not allow us to use it. Andrew, We are a software company - I was referring to our development team...Not Zendesk dev team. Hello Lisa - I didnt think you were Zendesk - nor am I - just a volunteer mod. Your workflow makes sense, thanks for clarifying. As Andrew observed in his first response to Lisa's question, we set it up like this on purpose; "On Hold" could be confusing for your customers so it's best to keep it out of the mix. All that said, it's hard to tell that the For end-users field isn't actually available for selection. It would probably be easier to differentiate between what's available and what's not if it were greyed out or something. @Jessie I am having the same issues as Lisa - We use Zendesk in the same way and the ability for end-users to see a status as "On-hold" as opposed to "Open" is valuable. I dont understand why Zendesk decided to implement this feature in this way because "could be confusing for your customers"...... isn't that exactly why you offer the ability to check and uncheck that box and give each Zendesk client the ability to shape Zendesk to our needs? If it were confusing, we would just turn it off ourselves. Is there anyway that we can have the box checked by a Zendesk developer for our instance and override the restriction? I believe that one of our Product Managers was doing some customer interviews about this functionality at one point, so I'm going to touch base with her and see if there's any new information to share. In the meantime, I'd encourage you to add your vote and detailed use case to the thread. If i change a ticket to on-hold, does a client receives any email? Not unless your triggers are set up to do that. I suggest a test ticket from an email outside your normal domain and try it out. FYI, the status on the Guide/Knowledge Base if a customer logs in to see their tickets, will be "Open". In other words, for you it is on hold but to the customer it will still show as open. Hello. We have the Team version of Zendesk, and I have followed the instructions to add the on-hold status. It comes up with a green tick saying "Field Status Updated", so I figure I am doing it correctly However, the option to then choose on-hold as a ticket status is not appearing for me or any other agent. Is there an extra step to get it started? Can we limit the On-Hold status to a certain group of agents? Hi Armani! Welcome to the Community! There isn't any in-built functionality that will do this, but you should be able to set up a trigger to accomplish the ultimate result. There isn't a condition in Triggers that will test for an agent group, so you'll need to create a custom field or add a tag to indicate the assignee's group. Then you'll set up your conditions to test for the ticket being updated, the ticket status as On-Hold, and the custom field or tag indicating a restricted group. Then you'll just set up the action to change the status back to Open or Pending. If a ticket is On Hold and the requester replies to the ticket, will the ticket automatically revert to Open? Yes, whenever a ticket is in pending, on-hold, or solved, it will pop back to "open" whenever the requester replies. @jessie @Armani - Just to clarify Jessies comment above (3 up) there IS an option in triggers around the ticket group that would make this very simple. So no need for a custom feild or tag. However the adding a comment part is NOT available and is more complex to do using a target (we use this workflow for other agent restrictions/reminders). Can I add custom ticket statuses?